AICESIS in partnership with the UN-NGO-IRENE, following the recommendations of the 4 MDG Regional Round tables,launched in 2006/07 an MDG AWARD for goal 2 "Education". 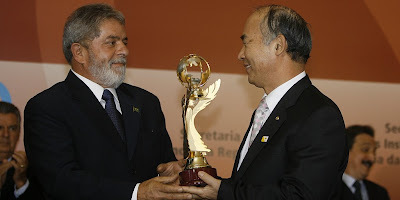 Four prizes were handed out by President Louis Da silva Lula in Brasilia, on 5 November 2007. Good neighbours of Korea, which has general consultative status with ECOSOC since 1996. It implements programmes for children, especially those with handicaps. Fondation Hernandina of Argentina, which has general consultative status with ECOSOC since 1992, and promotes child education, the environment and health. - The two other prizes went to African ESCs which have supported, promoted and backed NGOs that have been working exclusively towards the MDG training. The ESCC of Mali which has protected, supported and advised the association of cotton producers of Mali . The association carries out initiatives in support of basic education for high-quality producers. The ESCC's activities have drawn attention to the major mobilisation of African farmers as the main actors in development. The ESC of Ivory Coast which has supported, encouraged and promoted the association of African mothers. This association has been carrying out basic education programmes in the north and the south of the country, supporting African mothers with tenacity, consistency and talent.